When you think you've run out of ideas for football pep rallies, give the following suggestions a try. Every pep rally should be a fun and uplifting experience for everyone involved. However, these events grow stale very quickly if you follow the same format each time. You can certainly plan to introduce the team at their first rally of the season, but after that you'll need a new plan. That's why it's so important to come up with fresh ideas and activities for each rally to keep things interesting. Use your pep rally to treat your entire football team like kings on game day. It's easy to order gold cardboard crowns from a craft supplier like Oriental Trading, and you can often purchase them right at your local craft store. Make sure you have enough to cover every player on the team. Get in touch with the pep band well ahead of time and ask the trumpet players, trombone players and percussion section if they can put together some kind of heraldic cadence to play as the team makes their formal entry into the gymnasium or onto the football field. You can crown these kings of the football field and make a royal declaration of challenge to the opposing team. Your spirit signs for this event could be rolled like scrolls. Use a little watered down brown paint around the edges to make them look like parchment. Also be sure to create a mock throne for the head coach to sit on during the rally. Get together with your squad to brainstorm song selections, and then make up a set of dance moves that aren't too difficult so it doesn't take too long for the players to learn them. Tricycle race - Imagine how fun it would be to try to transport a football to a set line and back again while riding a tricycle. This race would provide a lot of laughs, and the winning team is the first to have their last member make it back to the starting line with football still in hand. Football head race - Every try to balance a football on your head? It isn't easy, but imagine trying to walk fast while you're doing it. This relay works the same way as the tricycle race with the first team to finish becoming the winners. Three-legged race with a twist - This is a standard three-legged race, but the partners have to hold the football between them at their hips. Now that takes some real coordination, and they aren't allowed to use their hands. If they drop the football, a cheerleader helper can put the ball back between their hips so they can continue the race. The first class to have all of their partners cross the finish line is the one that wins. 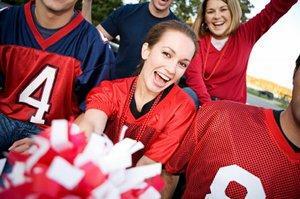 So, you now have some fun, new ideas for football pep rallies that you can spread out through the season. They'll help raise school spirit and perhaps even rev up your team for victory!